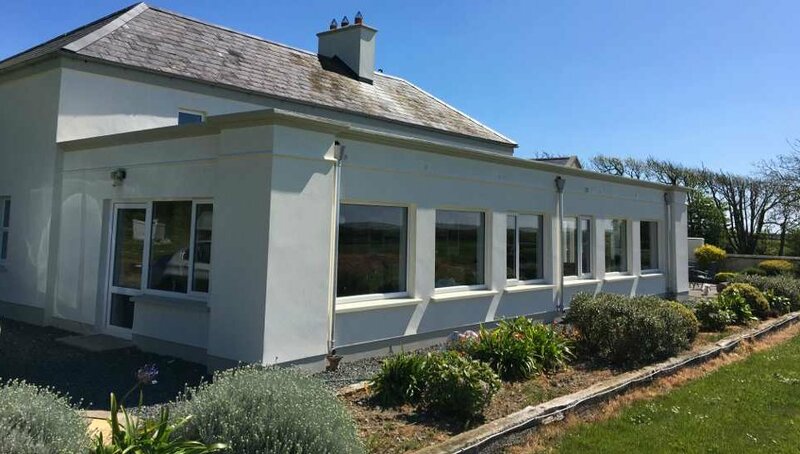 Sanderling Lodge is located in Tacumshane, Co Wexford (15km to Wexford, 10km to Rosslare, 1.5k km to beach and nearest pub and restaurant) with panoramic views over the country side and out to sea. Consisting of the following units, Sanderling Lodge (sleeps 9/10), Owl's Hoot (sleeps 6), Wagtail (sleeps 4) and the Swallows Nest (sleeps 2). In total it can sleep up to 22 people it is an ideal place for family or group holidays or events. • 12 minutes drive to Wexford Town. Sanderling and its stone barns are ideal for family holidays, family gatherings, special events, birthdays etc. It is conveniently located near Rosslare, beside Our Lady's Island and is 10 minutes walk to the nearest pub and restaurant. We provide a relaxing place for your family holiday, family gathering, 30th,40th, 50th,60th,70th etc celebrations or other gatherings such as bird watchers, fishermen, retirement celebrations, indeed any gathering where people wish to meet in a beautiful environment with beautiful countryside and sea views. Close to Rosslare, Wexford, Kilmore and with a choice of local beaches. We love what we do. Its a very special place to relax, unwind in a little oasis of calm but close enough to all amenities when you want it. Sanderling- Responsive Drupal Commerce Theme.